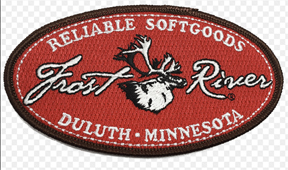 This Website is maintained by the Boundary Waters Advisory Committee and Outdoor Club. 3M does not participate in the operation of the Websites. 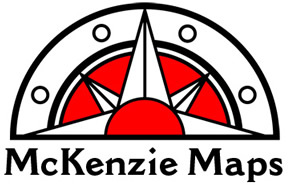 Any concerns about this Website should be referred to the site's Webmaster. For updated calendar of trips, see trip schedule and details on Meetup site "Friends of BWCA Trails." . If you have general questions about participating please see our Trips FAQ. The BWAC Trail Committee plans several trail clearing adventures in spring 2019 to reopen the Powwow Trail (PWT) for backpacking (the PWT has been officially open for hiking and backpacking for several years but sections have become impassable because of the extremely dense growth of jack pines, now 5-8 feet tall and often growing as close as one foot from each other. BWAC volunteers cleared 25 of the 30 mile long Powwow Trail in 2018. Help us clear the remaining five miles of jack pines that are blocking the trail and be one of the 100 volunteers who will "Open the Loop!" in 2019. 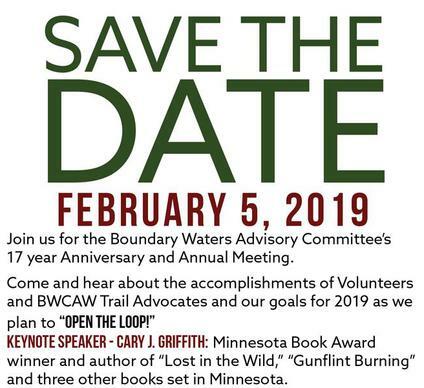 Learn more at BWAC Annual Meeting and dinner on February 5, and at presentations in Twin Cities and in Duluth. Keep up to date and join us for a hike through our ​Meetup group. The mission of the BWA Committee is simple: "To preserve the existing, intrinsically beautiful trails in the Boundary Waters Canoe Area Wilderness of the Superior National Forest." Following the passage of the National Forest Trails Systems Stewardship Act the BWA Committee wrote a comment letter to the Secretary of Agriculture, requesting that BWCA wilderness hiking trails, and specifically the Pow Wow Trail be selected as demonstration projects of US Forest Service cooperation with volunteer groups. BWA Committee acknowledges hard work of Minnesota representatives Rick Nolan and Tim Walz who co-sponsored the FFSTSA. Thank you. 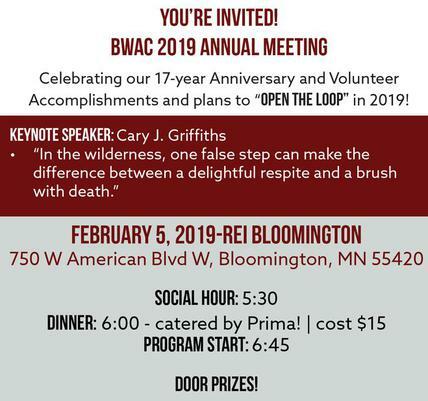 BWA Committee volunteers presented this winter to a combined audience of more than 120 hikers at REI, 3M Outdoor Club meeting and at "Backpacking Kick-off" event at Lebanon Hills Regional Park. Midwest Mountaineering provided door prize for the two latter presentations. Result? BWAC has recruited three full crews to help the USDA Forest Service to clean up the six mile section of the BWCAW Pow Wow hiking trail that Forest Service allows to be maintained. BWAC hopes that following 2016 successful clearing of this section by the Kekekabic Trail Assoc. 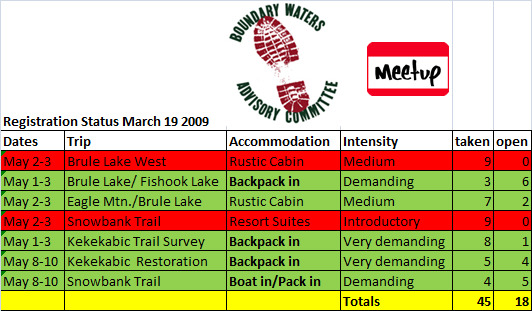 of the NCT and the BWAC volunteers, working under sponsorship of Fournier Outdoor Services in cooperation with USFS will lead to permission to clear remainder of the trail. See our Meetup for dates and particulars. To take a virtual trip of the entire Pow Wow Trail in 20 minute video montage from photos along the trail click here. Check out the BWAC Meetup site for list of upcoming events and trips.